Can I access library resources from Off Campus? Library resources can be accessed from off campus. Please see the Off Campus Access and for more information. Can I use BSWH wifi? BSWHCorporate, and BSWHBYOD are intended for employees of BSWH through authentication with their BSWH network ids and passwords. BSWHGuest is intended for patients and visitors without login credentials. NOTE: Access to the Baylor Health Sciences Library’s online resources are only available via the BSWHCorporate network. Users connected to the BSWHBYOD and BSWHGuest wifi networks will NOT be able to access the library’s eResources. Can I use College of Dentistry Wifi? Due to circumstances beyond the Baylor Health Sciences Library’s control, the IP address of the College’s wifi server is no longer on the College of Dentistry’s network. Therefore, users connected to the CoD wifi should consider themselves off campus users. More information about off campus access can be found on the Library’s Off Campus Access page. All requests will be processed during these hours. If you need assistance outside of these hours, you may email the Interlibrary Loan department at interlibloan@tamhsc.edu or call the library’s main desk at 214-828-8151 or 214-820-2377 during the library’s open hours. All services, including interlibrary loan and Get it for me services, are suspended for all library closures, including holidays. interlibrary loan and Get it for me services resume when the library reopens. What is Get it for me and who can use it? Get it for me is an interlibrary loan (ILL) service provided by the Baylor Health Sciences Library, allowing users to obtain books and/or articles that may not be part of the Library’s collection. The service is free to Library Affiliates, which includes faculty, students, staff, and clinicians at Texas A&M College of Dentistry and Baylor Scott & White Health – North. First-time users must create a Get it for me account. College of Dentistry users can register by logging in here. BSWH – North must use this registration form. Once an account is created, a request can be entered manually within the account, or directly from the Library’s databases (when full-text is requested). The Library fills Get it for me requests by sending PDFs to this account. How does Get it for me work with the library's databases, such as PubMed? On the Library’s subscription access page, a link to Get it for me is provided in the REQUEST THE DOC section. Clicking on the Request article through Get it for me link begins the process of obtaining the full-text version from another library through Interlibrary Loan and automatically fills out several required fields in the request form. Patrons may fill out a Literature Search Request online or at the Circulation Desk. Additionally, users may contact the Library through the Ask-A-Librarian service or by calling (214) 828-8151 or (214) 820-2377 and requesting to speak with a librarian. May I request a class to be taught by a librarian? Individual or group training classes for library resources may be requested online. Once redirected to the online form, be sure to select ‘Request a class’ from the drop-down menu under Reason for Contact. You may also contact the Library directly through Ask-A-Librarian or by calling (214) 828-8151 or (214) 820-2377. How do I schedule an appointment with a librarian? Patrons interested in scheduling an appointment with a librarian may do so by contacting the Library through the Ask-A-Librarian service or by calling (214) 828-8151 or (214) 820-2377. What is the cost of photocopying and how can I pay for this? The Library does not have copy machines for public use. The smaller copy machine across from the Library requires a department code and is for medical staff and departments. OpenAthens is a single sign on (SSO) solution that allows access the library’s resources for users both on and off campus. OpenAthens allows users to login to resources using their local network authentication systems (SecureAuth for BSWH, and Shibboleth for CoD) providing seamless access from any location. In addition, many of our provider’s web sites are “OpenAthens” aware, providing patrons with the ability to login via OpenAthens directly from their web sites (i.e. without going first going to the BHSL web site). Typically the link will say “institutional login”, “openathens login”, or “shibboleth login”. Logging in directly at sites that are OpenAthens aware means that users with “reader” apps (QxMD, ReadCube, Kopernio, etc.) can now access articles at those sites using this login method. Please see http://bhslibrary.tamhsc.edu/oa-changes/ for an step-by-step example of logging in to the New England Journal of Medicine via their OpenAthens aware login link. After a transition period of 2-3 months all of the library’s electronic resources will be accessible to all patrons via OpenAthens whether the patron is on or off campus. This will provide a consistent access method for all users no matter their location. Why the move to OpenAthens? Previously, the library used a tool called Ezproxy to provide off campus access. Ezproxy is an IP-based tool essentially masking an off campus user’s IP address (after logging in) so that they appear to be on campus. However, frequent IP changes and Internet security protocol updates have made the continued use of Ezproxy and other IP-based methods unsustainable. Hence, the shift to OpenAthens which is signon-based. Do I need to still click the Off Campus Access Link? Once all resources have been transitioned to OpenAthens, the Off Campus Access link is no longer necessary for patrons to be able to access resources while off campus. However, the Primo All Search tool has the ability to display only those electronic resources that are accessible to patrons based on their institutional affiliation (BSWH or Texas A&M College of Dentistry). As costs rise, more and more eResources are being purchased by the library for access by patrons of only one or the other institution. While ON campus, Primo All Search can use the patron’s IP address to determine what eResources they have access to. But when off campus users will need to login to Primo All Search in order for Primo know with which institution they are affiliated. Do I HAVE to login to Primo All Search from off campus? No, you can always use Primo All Search from off campus as a guest user. However, that could mean that you won’t see some eResources that you otherwise would have access to. How do I get a Primo All Search Account? Currently, you must come into the library and request a library card to get a Primo All Search account. An online solution will be available soon. What is Primo All Search? Primo All Search, powered by Ex Libris' Primo discovery & delivery tool, provides the most efficient way to discover and access the Library’s resources. Primo All Search allows users to simultaneously search across and quickly access the Library's multiple electronic and print resources. Users can initiate searches by entering search terms into the 'Primo All Search' search box on the Library’s homepage, or access the Primo All Search search page directly. More information on Primo All Search is available on the Primo End User Help page. NOTE: Primo All Search includes records and access links for most, but not all of the Library’s resources. Primo All Search does not index clinical decision support databases, such as UpToDate, as well as language learning modules and the Library's Research Guides. How do I login in Primo All Search? The Sign in link is available at the top-right corner of Primo All Search search and results pages. When logging in it’s important to choose the correct institutional affiliation from the pop-up box. Texas A&M College of Dentistry users will authenticate with Shibboleth using their TAMHSC assigned email addresses and passwords. Bayor Scott & White Health – North Texas employees will authenticate with SecureAuth using their network id and passwords. A BSWH-NTX employee’s Network ID is whatever they use to login to a computer on campus. Please note that before you can login to Primo All Search, your account must be activated. Any patron who has checked out a book or gotten a new library card since June 1, 2017 already has an activated account. Patrons who have BHSL library cards, but who have not checked out a book since June 1, 2017 will need to call or email the library at 214-828-8151 or askalibrarian@tamhsc.edu to update your account information with an email address. BSWH-NTX employees will also need to provide their Network ID-no password needs to be provided. Patrons who do not have library cards, but want to have a Primo All Search account simply need to come to the library to get a card. We are located on the first floor of the Truett building, in the hall connecting BUMC with the College of Dentistry, above the main cafeteria. Do I need to login to use Primo All Search? No. You do not have to be logged in to Primo All Search, or even have an active Primo user account, in order to search for Baylor Health Sciences Library resources via Primo. Can I use Primo All Search off campus? Yes, you can perform searches with Primo All Search from off-campus at any time. You will not be able to access any of the Baylor Health Sciences Library’s electronic resources unless you are affiliated with Texas A&M College of Dentistry or Baylor Scott & White Health – North Texas. After searching for a resource or topic in Primo All Search and clicking the access link, you will be redirected to a sign-in page and asked to choose your organization. More information about the Library’s off and on-campus access can be found on the Library’s Off-Campus Access page. What resources are included in the Catalog? The Library's Catalog provides records and location information for all of the Library's print books, print journals and theses. The catalog also allows users to directly access the Library's full eBook collection. The Library subscribes to over 110 authoritative databases in a number of health-science related disciplines. These databases consist of collections of eJournals and eBooks, and also include diagnostic aids, clinical guides, and language learning software. Patrons may search for specific databases, or browse by alphabet or subject. All databases, except UpToDate, are available to TAMBCD and Baylor Scott & White - North patrons from both on and off-campus. View a full listing of databases. The Library subscribes to over 100,000 eBooks through a number of publishers and vendors. eBook collections and titles are available on a multitude of subjects but are primarily aimed at health-science related disciplines. Patrons may search for eBooks from the "eBooks" tab on the Library's homepage and may access full text versions of titles directly from links on the Primo All Search results page(s). What eJournals does the Library subscribe to? The Library subscribes to thousands of full-text eJournals. EJournal titles may be searched either through the eJournals tab on the homepage or by using the eJournals link under the Resources menu. The Library has created a number of research and subject guides in support of the clinical, research and educational efforts of our patrons. The guides (in the form of tutorials, clinical tool sets and pathfinders) provide quick access to collections of resources specifically selected to meet the information needs of our users. Where can I find mobile apps for databases? Several of the library's subscribed databases have mobile apps. Click on the blue info button beside the database name to read more information about the database and to find out more about its mobile app. How do I report a problem with an eJournal, eBook, or Database? Please use the Questions or Comments form. Select “Problem accessing website or electronic resource(s)” from the Reason for Contact drop-down menu and select the appropriate resource type from the Resource in Question drop-down menu. How do I request a resource that the Library does not own? Resources that are not currently part of the Baylor Health Sciences Library collection may be requested through the Library’s Get It For Me service. Users will first need to supply their login credentials to fill out and submit their ILL request. Requests may also be submitted at the Library’s Circulation Desk. If you would like to request a resource purchase, please use the Questions or Comments form. Select “Suggestion for new resource(s)” from the Reason for Contact drop-down menu and the appropriate resource type from the Resource in Question drop-down menu. What is Endnote and how do I get it? EndNote is a citation manager and bibliography creator. If you are a College of Dentistry employee, please contact the Help Desk at 1-800-799-7472 or email helpdesk@tamhsc.edu for a copy of EndNote for your work computer or for a personal copy login to software.tamu.edu. If you are a College of Dentistry student, please login to software.tamu.edu to obtain a copy of EndNote. EndNote is not available for distribution to Baylor Scott & White Health employees. However, Baylor Scott & White Health employees may set up a free EndNote Basic web account at myendnoteweb.com for access to the Web version of the software. See the EndNote Basic product page for more information on the available features. Please see the EndNote website for training and technical support. The Baylor Health Sciences Library services the educational, research and clinical programs of Texas A&M College of Dentistry, The Texas A&M Health Science Center and Baylor Scott & White Health – North. However, members of the general public are welcome to use the Library’s collection in house. Those eligible may obtain their library card by filling out a request form at the Circulation Desk. There is no limit to the number of books you may check out. Most books can be checked out for two weeks. The renewal period for most books is two weeks. All Texas A&M College of Medicine Collection books are non-renewable. Books that have been placed on hold by another library user may not be renewed; the items must be returned by their due date for others to utilize. If you need to renew, you can do so by calling the Circulation Desk at 214-828-8151 or 214-820-2377, through your Primo user account, or in person. What is the policy for overdue books? The Library does not charge fines. However, patrons who receive three consecutive overdue notices for the same item(s) will be billed for replacement costs of the overdue item(s) and will be suspended until the bill is paid or items are returned. Library suspension excludes the patron from Library services including checkout, course reserves, interlibrary loan/document delivery, photocopying, and literature search requests. How do I recommend titles to be added to the collection? Any library user may recommend titles for the collection by either filling out the Questions of Comments form or completing a Recommended Purchases form at the Circulation Desk. Recommendations will be evaluated by the Library’s Collection Development Librarian according to relevancy and support of the Baylor Health Sciences Library mission and policy. The Library accepts donations, however, once received, the item becomes the sole property of Baylor Health Sciences Library. As such, the Library reserves the right to decide whether or not to add the item to the collection based upon its relevancy and usefulness to the collection, completeness of the volume or set, and currency of the information. The Library accepts only current textbooks, medical or dental books published within the past 5 years, or books of historical value published before 1950. How do I create a shortcut to the Library's website on my mobile device? You will now see an icon on the home screen of iPad or iPhone. If you do not see an icon on your home screen, make sure the icon is not on another page by swiping across the home screen to the left. Some versions of the Chrome may have the option to Add to Home Screen in the settings menu. 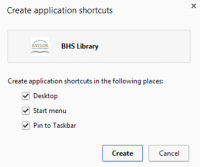 How do I create a shortcut to the Library's website on my desktop or laptop?